No industry is immune to this wave of disruptive digital innovation. 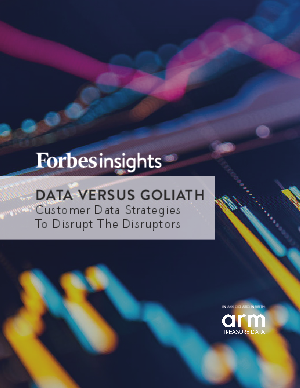 At the core of this disruption—being driven by startups and incumbent players alike—is the ability to harness data generated through customer transactions, engagements and, increasingly, connected smart devices. While business leaders recognize that they must move fast to become customer-data-driven enterprises, they’re nowhere close to the finish line. In fact, most are only starting to grasp the power of customer data. According to a new global survey conducted by Forbes Insights, in association with Treasure Data, only 13% of companies can be considered “leaders” in leveraging customer data. Executives within these leading organizations indicate they are highly confident their companies have taken the necessary steps to ensure they are effectively utilizing customer data. A larger percentage of organizations, however, the “laggards,” are only at the beginning of their efforts to convert customer data into actionable insights. Yet it’s those who are embracing customer data and analytics who are seeing greater returns on investment and are likely to be disruptive leaders within their markets. What does it take to succeed in today’s hyper-competitive and hyper-connected digital economy? Keep reading to find out.